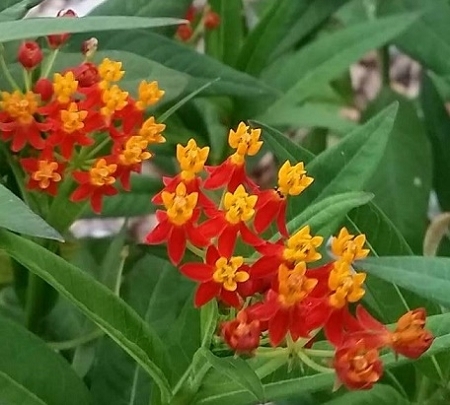 Silky Scarlet Milkweed (asclepias curassavica 'silky scarlet') - Also called Mexican Milkweed or Tropical Milkweed. Host and nectar plant for monarch butterfly. Bright scarlet orange and yellow flowers bloom summer through fall. Perennial zones 8-11. Milkweed are poisonous if ingested. Live plant in 3 inch container. I ordered one plant last year and kept it in a large pot because I live in a condo and it would not survive a Chicago area winter outside. It did so well that I ordered another. Just like last year, the plant arrived in good condition--not even wilted!